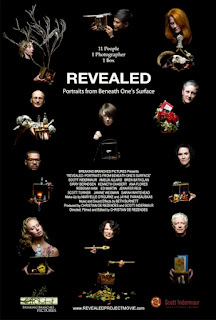 REVEALED: Portraits from Beneath One’s Surface is a film that features 11 individuals who were part of photographer Scott Indermaur's larger project, REVEALED. Scott creates one-of-a-kind portraits of individuals who have been given the unique challenge of symbolically capturing their beliefs, essence. His project has included more than 200 subjects from around the country to date. The film about the project, REVEALED: Portraits from Beneath One’s Surface, explores the insights and the impact REVEALED has had on these individuals and on Indermaur himself. It was filmed in Providence and East Greenwich by Christian de Rezendes of Breaking Branches Pictures. We premiere REVEALED: Portraits from Beneath One’s Surface on Saturday, August 11 at 7 P.M. as part of the ongoing series Rhode Island Stories, with encore on Sunday August 12 at 11 P.M. on Rhode Island PBS. On Learn, REVEALED: Portraits from Beneath One’s Surface airs on Wednesday, August 15 at 10 P.M.
“Upon examining my relationship with my own spirituality, I wanted to learn how other people connect with their sense of self. My intentions were to photograph spirituality from a non-literal perspective. I wanted to peel back the layers of traditional spirituality and focus on the individual’s personal essence. 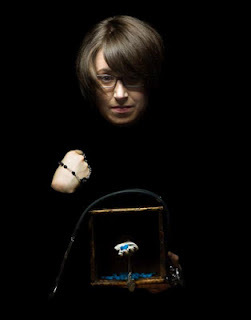 “I presented my subjects with a small wooden box and asked them in advance of the photography session to bring items that represented their spiritual experience in which to fill the space. The concept of identity and the awareness of a higher existence quickly evolved into a vessel of self-exploration and quiet confession. I soon discovered that my subjects shared far more … the works I am selecting for publication illustrate my subjects’ responses to the project, as well as the inadvertent disclosures of their most subtle hopes and fears. To read the essays, to see a slideshow of Scott’s beautiful portraiture, and for more information about his REVEALED project, visit Scott’s Web site. Filmmaker Christian de Rezendes (whose work includes 41 and Alzira's Story, seen on Rhode Island PBS) has been acclaimed here, here, and here for capturing the essence of the project, reflecting its intimacy and sharing profound insights on the individuals and their stories - and ourselves. Visit Breaking Branches Pictures for more information about Christian's current projects. 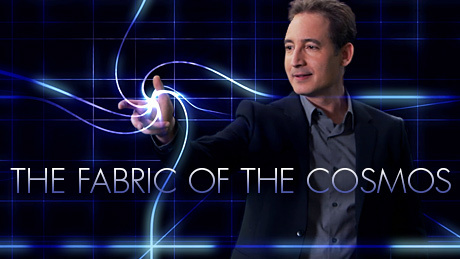 A Lively Experiment, July 20 at 8:30 P.M.
"The Fabric of the Cosmos," a four-hour series on NOVA based on the book by renowned physicist and author Brian Greene, takes us to the frontiers of physics to see how scientists are piecing together the most complete picture yet of space, time, and the universe. With each step, audiences will discover that just beneath the surface of our everyday experience lies a world we’d hardly recognize—a startling world far stranger and more wondrous than anyone expected. Originally broadcast on PBS in November 2011, WSBE Rhode Island PBS airs this NOVA series on four consecutive Mondays, beginning July 30 at 9 p.m., with rebroadcasts of same episodes on the following Wednesdays at 1:30 a.m. and Thursdays at 4 a.m. The three-part film directed by Ken Burns and Lynn Novick tells the story of the rise, rule and fall of the Eighteenth Amendment to the U.S. Constitution and the entire era it encompassed. 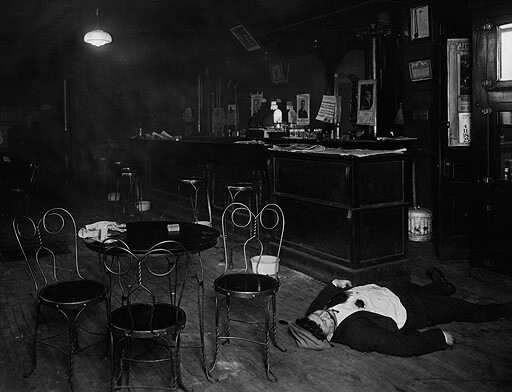 Watch PROHIBITION unfold on WSBE Rhode Island PBS on Thursdays at 9 P.M. starting July 12. Episodes repeat on Saturdays at 1:30 A.M. and noon. 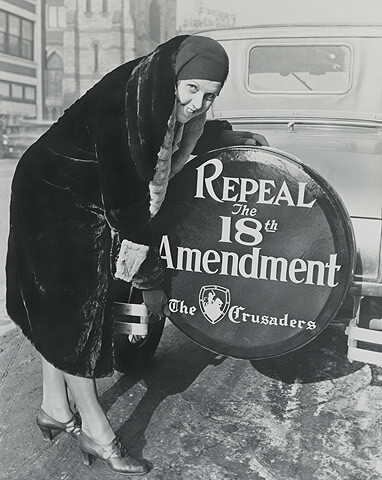 By the late 19th century the Women’s Christian Temperance Union could claim some significant successes – it had lobbied for local laws restricting alcohol and created an anti-alcohol educational campaign that reached into nearly every schoolroom in the nation. 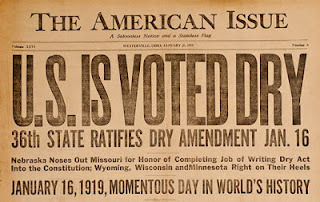 But the WCTU’s ultimate goal, a prohibition amendment to the constitution, still seemed impossibly out of reach. 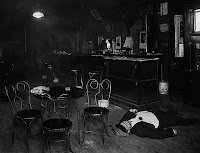 The Anti-Saloon League became the most successful single issue lobbying organization in American history, willing to form alliances with any and all constituencies that would advance its sole goal: a constitutional amendment that would ban the manufacture, sale and transportation of alcohol. 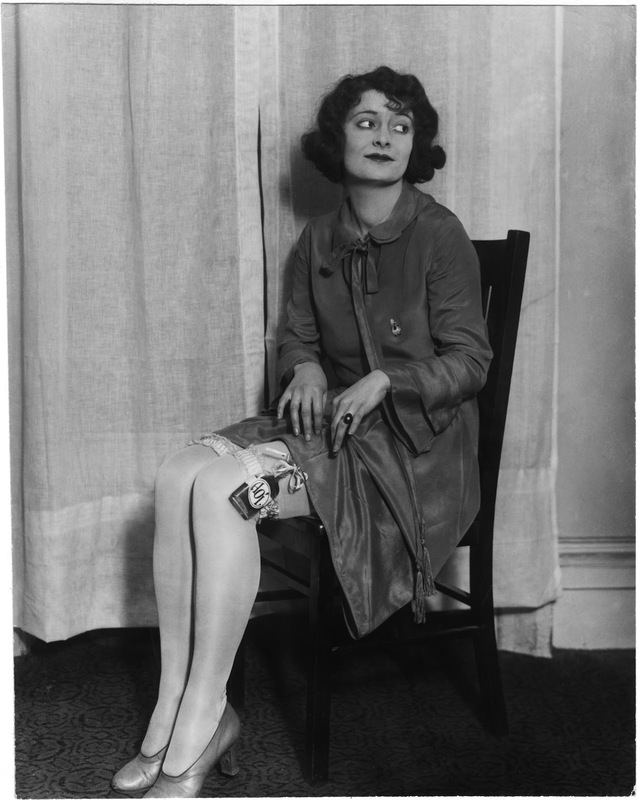 They united with Democrats and Republicans, Progressives, Populists, and suffragists, the Ku Klux Klan and the NAACP, the International Workers of the World, and many of America’s most powerful industrialists including Henry Ford, John D. Rockefeller, Jr., and Andrew Carnegie – all of whom supported ASL’s increasingly effective campaign. 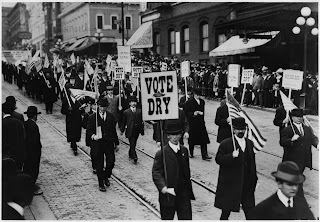 With ratification of the income tax amendment in 1913, and the federal government no longer dependent on liquor taxes to fund its operations, the ASL moved into high gear. As anti-German fervor rose to a near frenzy with the American entry into the First World War, ASL propaganda effectively connected beer brewers with Germans and treason in the public mind. 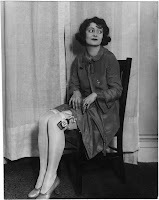 Most politicians dared not defy the ASL and in 1917 the 18th amendment sailed through both houses of Congress; it was ratified by the states in just 13 months. 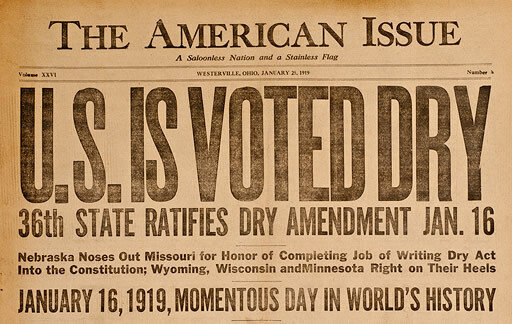 At 12:01 A.M. on January 17, 1920, the amendment went into effect and Prohibitionists rejoiced that, at long last, America had become officially and irrevocably dry. 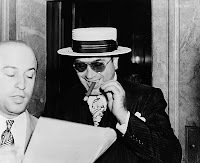 But just a few minutes later, six masked bandits with pistols emptied two freight cars full of whiskey from a rail yard in Chicago, another gang stole four casks of grain alcohol from a government bonded warehouse, and still another hijacked a truck carrying whiskey. In this groundbreaking series, historian Michael Wood tells the story of one place – the village of Kibworth, Leicestershire – throughout the whole of English history. Located in the very heart of England, Kibworth has lived through the Black Death, the Civil War and the Industrial Revolution and was even bombed in World War II. WSBE Rhode Island PBS airs four-episode series on Thursdays at 8 P.M. beginning July 12, with rebroadcast on Saturdays at 12:30 A.M. (half after midnight). Jul 12/14 - Romans to Normans - With the help of the local people and using archaeology, landscape, language and DNA, Michael uncovers the lost history of the first thousand years of the village, featuring a Roman villa, Anglo-Saxons and Vikings and graphic evidence of life on the eve of the Norman Conquest. Jul 19/21 - Peasants’ Revolt and the Black Death charts events in the village leading to the people’s involvement in the Civil War of Simon de Montfort and follows the story of Kibworth as it reaches the catastrophic 14th century. The village goes through the worst famine in European history, and then, as revealed in the astonishing village archive in Merton College Oxford, two-thirds of the people die in the Black Death. Helped by today’s residents - field walking and reading the historical texts - and by the local schoolchildren digging archaeological test pits, Michael Wood follows stories of individual lives through these times, out of which the English idea of community and the English character begin to emerge. Jul 26/28 - The Seeds of Reform - The story of Kibworth moves on to dramatic battles of conscience in the time of the Hundred Years’ War. Discover amazing finds in the school archive that help trace peasant education back to the 14th century, when the people themselves set up the first school for their children. Some villagers join in a rebellion against King Henry V, while others rise to become middle-class merchants in the textile town of Coventry. Kibworth experiences the dramatic events of Henry VIII’s Protestant Reformation and the battles of the English Civil War. Aug 2/4 - The Birth of Modern England Track Kibworth’s 17th-century dissenters, travel on the Grand Union Canal and learn about an 18th-century feminist writer from Kibworth who was a pioneer of children’s books. The story of a young highwayman transported to Australia comes alive as his descendants visit Kibworth to uncover their roots. The Industrial Revolution reaches the village with framework knitting factories. Helped by today’s residents, Michael Wood uncovers the secret history of a Victorian village, visits World War I battlefields and recalls life in World War II when the village was bombed. Lastly, see Kibworth as it is today — a growing, multicultural village. WSBE Rhode Island PBS and the Ocean State Theatre Company have partnered to bring our members a series of opportunities for free tickets to performances all summer long at Theatre By The Sea in Matunuck. Check the WSBE Web page for details about this members-only exclusive to win tickets to three award-winning musicals and a Rhode Island premiere comedy, now through September. Each pair of tickets is valued at $108. WSBE Rhode Island PBS members can enter one or all of the ticket giveaways. The first drawing for tickets to The Sound of Music will be on Tuesday afternoon, July 10. The Web page has the registration forms and deadlines for the other drawings, too. Free tickets to award-winning musicals and comedy at the historic Theatre By The Sea - it's just one more way we appreciate our members and say, "Thank you for supporting WSBE!" All shows are produced by the Ocean State Theatre Company, a non-profit 501(c)(3) organization. Mr. Steve from PBS Kids is bringing his high energy musical show - SteveSongs - to the Theatre By The Sea in Matunuck, on Friday July 13 for two shows, 10 a.m. and 12 noon. Of course, we have tickets for you! TEN lucky RI PBS Kids Club families will see the show for free. Hop aboard! Drawing is TUESDAY, July 10! Where in the World is Wizbee? Summer is here, and that means more outdoor activities with family and friends. WSBE Rhode Island PBS, your local public television station, invites you to take us with you where ever you go this summer. It's easy, really - take Wizbee, the WSBE bird! And then tell us, "Where in the World is Wizbee?" Wizbee, named for the station's call letters, WSBE, is ready to accompany you anywhere - to the beach, the park, the zoo, the museum, the backyard cook out - every where you are, Wizbee's with you! We invite you to share with us Wizbee's adventures with you. Take a picture with Wizbee - don't forget to include yourself in the shot - and let us know, "Where in the World is Wizbee?" 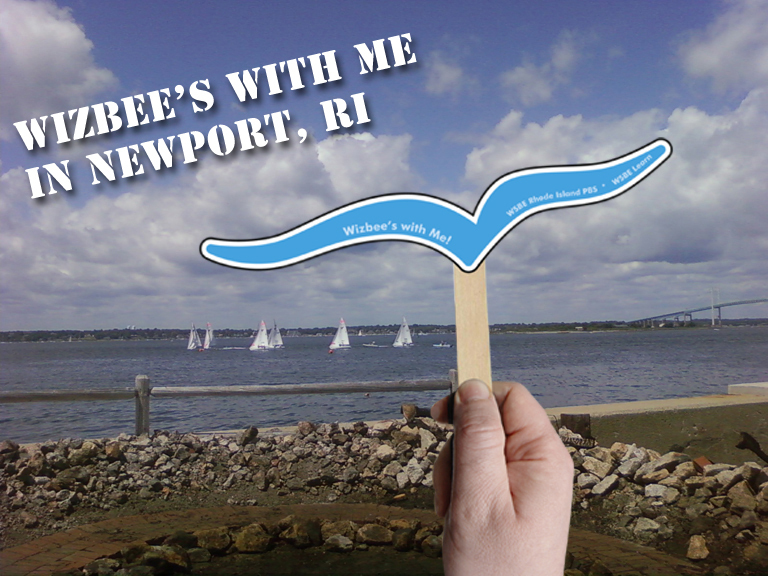 Hint: Wizbee is particularly fond of local Ocean State and Bay state locations but, hey, it's a big world - you decide! We give you the wings - how you fly is up to you! 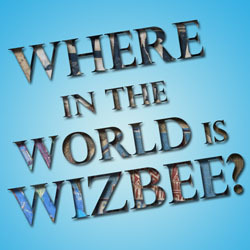 So, Where in the World is Wizbee? Why, Wizbee's with you! From everyone at WSBE, your local public television station, have a fun and safe summer.